I am swimming in loose photos from the past 25 years! 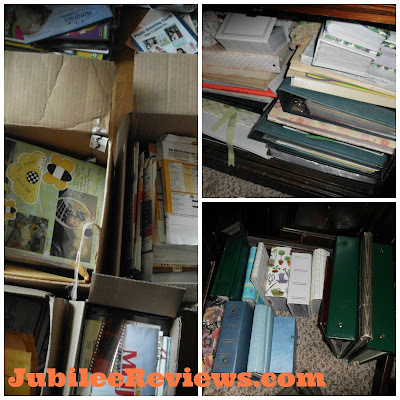 I do have many photo albums, but many more that are just in boxes. I even have those fun negatives that my kids have no clue what they were used for! Some of the photos that are in albums looks like the pictures may not be as safe as they could be. So how do you organize your loose photos? I was a picture taking freak ever since I was in high school. It was always, "Oh no, Melanie has her camera out AGAIN". It may have been crazy then, but now that I am getting older and forgetful, the photos help so much! How do you organize this mess? Do I organize by child and have a separate plastic tote for each one? Do I organize by year and go through the trouble of putting them in order in a box? Do I buy a zillion new photo albums and try to get them all put in? Do I spend the rest of life scanning them into the computer (which would require buying a scanner) so that they are all on disc? And once we decide how to organize, where do we put them? Do we get a book shelf to store all of the photos? Put them in the dark recesses of the closet? Put some in frames and line the wall? I would love to hear your ideas on organizing photos! This is a big project that needs tackled and I am hoping to be able to post with an updated look soon! This is a BIG problem I have also. I love having the photo albums but the ones from years and years ago are not holding up. I am still trying to figure out what to do. The only thing I have been able to think of is maybe scanning them all onto computer and making photo books.